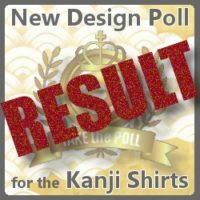 Thank you for voting in the KansaiChick’s Kanji Shirt Poll! We have the results and the latest on going poll here! The No.1 popular kanji will be definitely come out next! New Ideas are Welcome from Voters! Please Choose “Other” and Write Your Idea. The poll will be updated/adjusted and will remain here in KansaiChick website for the time being. So, if you feel like voting later, take the poll anytime for the next No.1 kanji! 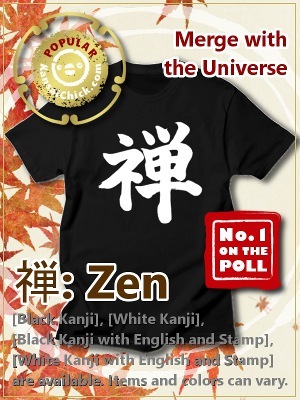 The No.1 popular kanji in this time is… “禅 (Zen)”! Thank you for voting “the Zen Philosophy”! 禅 shirt will come out next in the KansaiChick Japanese kanji shirt collection. 夜行性(yakousei: Nocturnal) stays on the list in the poll this time, but this one has a big potential will get the No.1 spot in the next result. From the No.3 “怪獣(Kaiju)”, the No.4 “自由(Freedom)”, and the No.5 “最強(The Strongest)” had no big difference, so I’ll wait longer till make a comment. And one more thing, if you vote for “Other” and you have a specific idea, please write the word in your mind. You can type it in English or Japanese. So, I may add the word to the list of the poll! 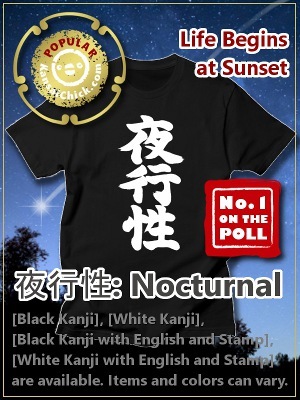 The No.1 popular kanji in this time is… “夜行性(Nocturnal)”! Thank you for voting “Night Owls”! 夜行性 shirt will come out next in the KansaiChick Japanese kanji shirt collection. The No.3 “反抗期 (Rebellious Phase)” and the No.4 “無敵 (Invincible)” were almost tie! And they are followed by the No.5 “怪獣 (Kaiju)” and the No.6 “空手道 (Karate-dou)”. 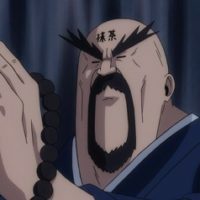 自由 (jiyuu: Freedom) stays on the list in the poll this time. The No.3 and 4 are very close, so anyone has a potential will get the No.1 in the next result. The No.1 popular kanji in this time is… “自由 (Freedom)”! Thank you for voting, everybody! Whew, actually Freedom was in the second place for a moment but it got the No.1 in the end. OK! “Freedom” will come out next in the KansaiChick Japanese Kanji Shirt Collection! Then, the No.2 was “無敵 (Invincible)” and the No.3 was “最強 (Strongest)”. What!? Who could imagine this former No.7 would jump up to the 3nd place!? Was something “Strongest” on TV?? There are no big gaps between the No.2 and the No.3! Let’s see what will happen in next poll. The No.4 was “反抗期 (Rebellious Phase)”, and the No.5 was “怪獣 (Kaiju)”. Both of them were the 3rd place for a moment, but they settled here at the current time. The No.6 was “空手道 (Karate-dou)”, then the No.7 was “禁煙　(No Smoking)”. The Kanji newly added to the list is inevitably disadvantageous but I see them having great potential. By the way, fortunately I received some “other” opinions this time! Thank you for the ideas! Fearless : It can be “恐れなし”, “不敵” or　”大胆不敵”. 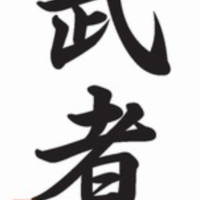 I think “大胆不敵” contains the best meanings for the person having nerves of steel and being fearless. I’ll add it to the list! Bullet Club : I’m sorry! It’s the name of the professional wrestling team, so I should not use the word. T-shirt : “Tシャツ” is funny! 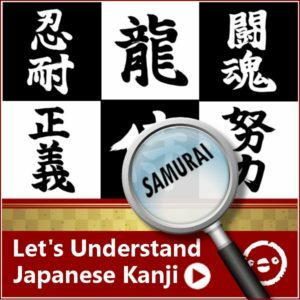 However it’s not a Kanji word, so I won’t add it to the list this time, but i am not opposed to adding Japanese not consisting of kanji in the future. Thanks anyway! 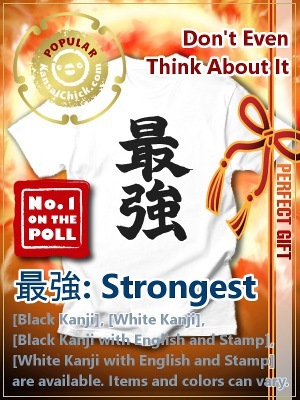 The No.1 popular kanji in this time is… “最強 (Strongest)”! Thank you for voting, everybody! This kanji word “最強” finally did it! It jumped up to the No.1 from the 3rd place!! 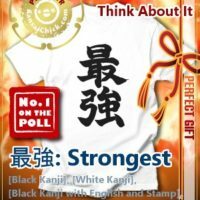 Now officially “Strongest” will come out next in the KansaiChick Japanese Kanji Shirt Collection! Then, the No.2 was “無敵 (Invincible)”…again. o(‘Д’)o But 無敵 is doing great and it was so close to the No.1 for a while. I can imagine it will be the top next time…but we need to be careful! The No.3 is right behind it! The No.4 was “怪獣 (Kaiju)”, and the No.5 was “大胆不敵 (Fearless)”. and 大胆不敵 has just added to the list but it’s doing fabulous! The No.6 was “禁煙 (No Smoking)”, then the No.7 was “空手道 (Karate-dou)”. They switched their spots. Both of them getting votes slowly but surely. Well, let’s see what will happen by the end of the year…! And this time I got 2 other ideas from voters! Gay : It can be “同性愛者”. Supporting LGBT is important I think. However, there are so many harmful people to sexial minorities. 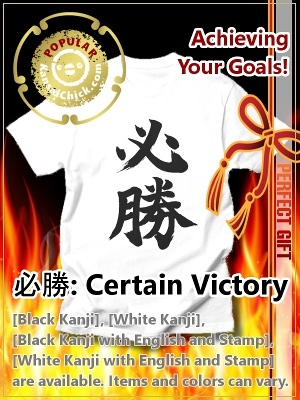 I don’t want my kanji shirt to cause any violence, so I will not make this one. Thanks anyway!! I’m a potato. : Hmm, I’m sorry but this phrase contains a lot of meanings and it’s too tough to put into a kanji word…. By the way, potate is “芋” in kanji. Some mean people use the word to describe certain person like “outdated ugly looking person”, “unsophisticated person”, or “person who has a poor motor skill”. 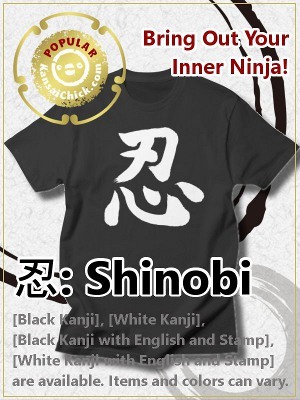 The No.1 popular kanji in this time is “無敵 (Invincible)”! Whew, thank goodness. Finally it got the top after 3 times of being stuck in the Number 2 slot. Now it will come out in the KansaiChick Japanese Kanji Shirt Collection! I will count the TOTAL as one set of designs. The No.2 goes to “大胆不敵 (Fearless)”. And the No. 3 is “怪獣 (Kaiju)”. They were the No. 3 and 4 last time. Do you think one of them will win in the next poll?? The No.7 goes to “空手道 (Karate-dou)”, and the No.8 is “投票 (Vote)”. Hopefully, “Vote” gets the No.1 by 2020! Thank you for voting, everybody! In this time, I received so many “Other” original answers from the voters. “Good Spirits” is owned by nobody, and I can add it to the list. Thank you very much for the idea! “Good Spirits” can be…”上機嫌”, “前向き”, or “元気” in Kanji word. 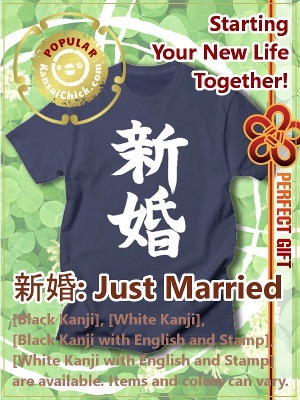 元気 suits Kanji shirt and it means “Healthy, Energetic, in Good Mood”. 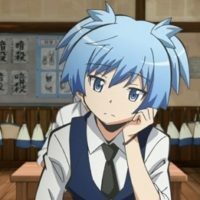 Thank you for the ideas about the Anime show! But unfortunately, I can’t add them into the list. Because we are not allowed to use specific characters’ names. Thank you for understanding! And I got another answer “KPOP”, thank you! …but I can’t write this word in Kanji! So, I’m sorry…! Thanks anyway! New choice is 元気 (Good Spirits): For energetic people in good mood.